Colored Lens Set The red lens is used to help maintain "night vision." General applications include: aircraft, boats, ships, military operations, police and security work. The blue lens helps penetrate through smoke and fog. 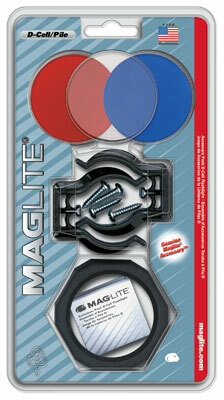 Mounting Brackets (Fit D-Cell Only) Mount your Mag-Lite® flashlight on a wall, in a vehicle, boat, airplane or home.